Blacksmith Rickert of Vinheim is a Character in Dark Souls. Rickert is found trapped in a cell with no intention to leave. After speaking to him you will learn that he is one of the best blacksmiths in Vinheim. 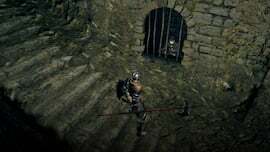 This brings up the question of if he commited a crime to be put in that cell and, if he did, it must have been before New Londo was flooded for law exists no more in New Londo Ruins. It also brings up the question if he did commit a crime, then what did he do to make it so even HE doesn't wish for rescue or escape. He does mention that he feels that it would be better to stay in his cell than to risk leaving and going hollow. This blacksmith will upgrade weapons giving them Magic and Enchanted properties. Encountered in New Londo Ruins. After stepping off the elevator coming from Firelink Shrine, head down the stairs and stick to the right side, you will come across an undead laying on the edge near the water. Near the undead is a staircase which will lead down to Rickert who is trapped behind bars and doesn't wish to leave. When given the enchanted ember found in Darkroot Garden he will be able to ascend +5 Magic Weapons to Enchanted Weapons. Rickert can be touched with a spear through the bars. Be careful or you might hurt him and turn him against you. He doesn't get on battle stance, but won't let you buy his services anymore. Similar to Petrus of Thorolund, Rickert wears armor that cannot be achieved in the game. However, the armor is in the unused game files (Mage Smith Set). Rickert is also the name of an character from "Berserk," and the character is also a blacksmith. Whether or not this is an easter egg is unknown.